Are you an open source employer, would you like to hire freshers ? Firstplanet is providing a unique platform for jobseekers and their work is commendable for providing the right guidance and support for the raw talents. Our HR Team expressed the desire of making more and more hiring in future via firstplanet, as we could source jobseekers strong in both technical and managerial skills. Firstplanet have provided a very good quality and timely recruitment service to us. I have had the pleasure of working with a team of professionals within the FirstPlanet team.. This video is my personal experience at FirstPlanet. I attended this program just to occupy my free time but i didnt know that they would give me an excellent training. Every year more than 1 lakh Engineering students pass out of TN colleges but only 18% of the Freshers have employability skills for IT. Then what will the remaining 82% do? Hi, I completed M.Sc(IT). 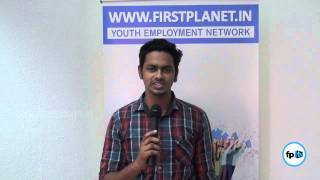 I came to know about firstplanet and their free training program for job seekers. I came to know about the new topics in open source. I am a fresher like you. Before joining CODEREADY, I was like a passenger without ticket in a bus but after joining CODEREADY, I have got a ticket as well as a comfortable seat.